Kuta Beach is the main place that crosses in everyone mind, whenever they want to go to Bali. The best thing to access the beach is by book a room in Kuta Beach hotel Bali. For years, Bali always be the best place to visit on the holiday. Many visitors come across the world just to enjoy the beauty of The Island of The Gods. The diversities of the tourism attractions in here make people want to come over and over again. Among those numerous attractions, the one that you cannot miss is the beach. Almost all the Bali’s regions have several amazing beaches. However, the most well-known one is Kuta Beach. Located near the International Airport, you may visit this beach directly after you arrive at the airport. People say that enjoying Kuta Beach is not enough just for a day! So, if you want to cherish its beauty whenever you want, stay in the hotel near the beach would be perfect. Moreover, here are some lists of best Kuta Beach hotel Bali, enjoy. As we know that Bali is famous for its beaches. You can choose wherever you want because all of them serve you with magnificent scenery. The best sunset spot in Bali is Kuta Beach. For your information, due to its popularity both inside and outside Kuta Beach are crowded. If you stay away from the Kuta Beach, your access would be a bit difficult. So, it’s better for you to book a room near this beach. 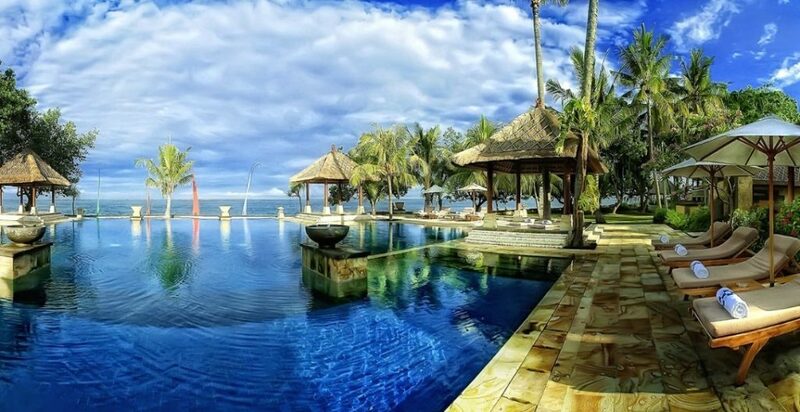 The Anvaya Beach Resort Bali is one of the amazing places to stay near Kuta Beach. The location of this property is not far from the beach, you just need to drive for 5 minutes long or cycling for around 15 minutes. If you want another beach options, then Tuban Beach is just 500 meters away from the hotel. The scenery is as great as Kuta Beach, so you won’t be regret to visit it. The best natural attractions that you can see at the beach are sunset and sunrise. Moreover, people choose the sunset one rather than the sunrise. You don’t need to wake up early, besides the scenery is clearer than the sunrise. Kuta beach is the best place to watch the sun slips down. You need to come here around 3 PM then wait for the sunset comes. However, you need to share the place with lots of people. If you want a private natural show, you may stay in the beachfront hotel. One of the most booked hotels near Kuta Beach is Discovery Kartika Plaza. 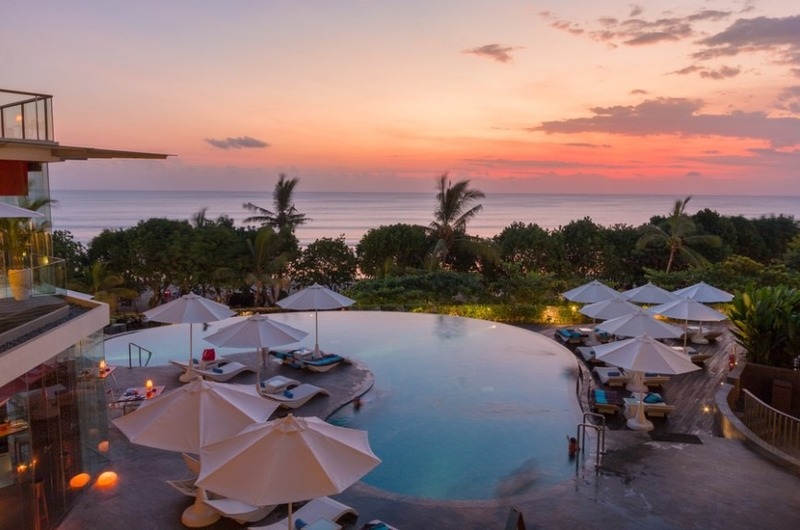 This Kuta Beach hotel Bali provides a direct access to the beach. You don’t need to jump down the crowds just to enjoy the sunset. If you book a room in here, your sunset attraction is just right in front of your window! Moreover, you may play in the outdoor pool that has a wide entrance to Kuta Beach. Whenever people talk about Bali, they will mention the lovely beaches. There are countless beaches from the famous ones till the virgin ones. If you have lots of time, you can explore them then find each of their attractiveness! Nevertheless, the very first beach that you must not miss is Kuta Beach. The renowned things in here are the white-sandy beach, the challenging waves, and the amazing sunset view. 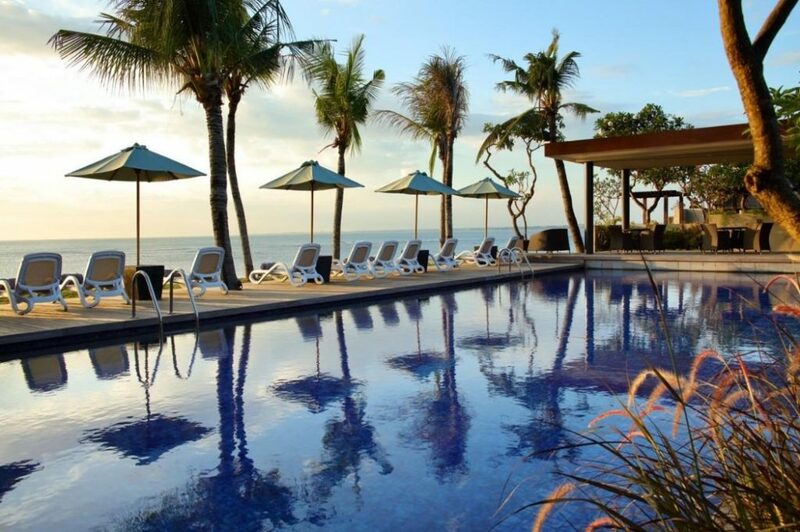 If you want to have all of them easily, you may stay in Sheraton Bali Kuta Resort. All of your beach attractions are just right before your sight. You don’t need to drive and get into traffic to reach Kuta Beach! The only thing that you need to do is walking lightly to the beach! Moreover, the famous Kuta shopping center, Beach Walk, is 500 meters from your place. When you come here, the elegant yet modern decoration will please your eyes. The room is quite spacious with the great ocean view outside your window. If you love water activity, the outdoor pool is more than enough to fulfill your desire. Bali main landmark is Kuta Beach. This beach is a free-pass beach that has tons of fun things to do. Most of the activities are free, except for the water sport. Furthermore, the popular activity is sunset sightseeing. Due to its popularity, Kuta Beach has turned into such a hustle place, especially at the sunset time. If you want to see the attractions, then you need to bear the noise and crowds. To make your sunset sightseeing be more secluded, you can stay at The Patra Bali Resort & Villas. 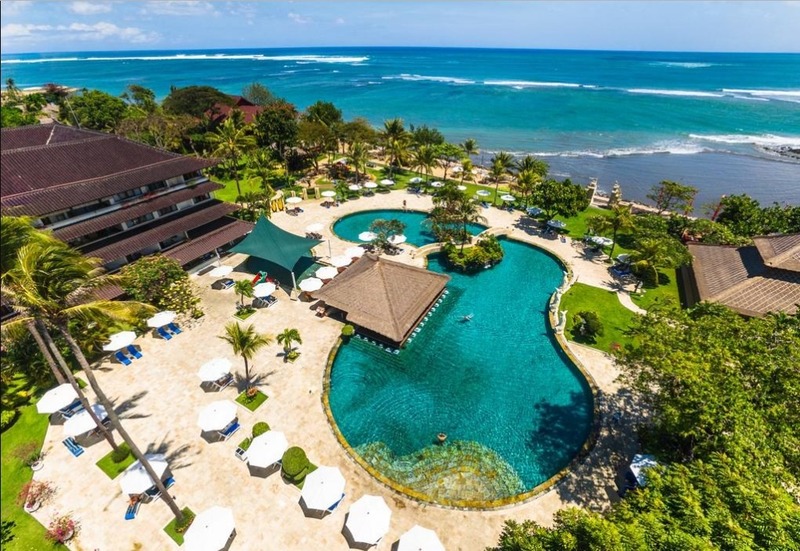 This beachfront resort is the great Kuta Beach hotel Bali. The decoration and furniture are full of thick yet heavy wood. The main design of the resort is simple elegance, which means that your resting time would be amazing! This place has a wide area and 206 rooms in service. You may pick your most suitable room, then the staff will directly prepare it for you. Kuta Beach sunset view is far from doubtful. For years, visitors from all over the world come to here just to evidence its loveliness sunset panorama. Once they see the sunset view, they will definitely come again to watch it over again. The more beautiful the beach is, the more visitors to come and enjoy the view. This kind of situation is happening in Kuta Beach. Even though the beach has no admission fee, and you can visit it whenever you want, your beach time will always be fussy. There are two options for you if you want a private situation; visit Kuta Beach in the middle of the night, or rent a room near Kuta Beach. One of Kuta Beach hotel Bali is Grand Inna Kuta. Even though this hotel is just a four-star hotel, it has a great name among the travelers. The hotel is one of the oldest beachfront hotels in Kuta. So, whenever the visitors want to a beach view hotel yet affordable, they will directly book a room in Grand Inna Kuta. The services are quite good compared to the price. So, who says staying in the beachfront place will cost you lots of money?